The Centre for Medical Ethics and Law (CMEL) hosted a two-day conference (25-26 August 2017) on compulsory mental health treatment in Hong Kong and the way forward. The conference featured philosophical, human rights, legal and medical perspectives. The speakers included a judge from the United Kingdom, medical practitioners and academics from the UK, New Zealand, the United States, and Hong Kong. The conference was organised by Assistant Professor and Deputy Director of CMEL, Ms Daisy Cheung, who agreed to be interviewed by HKU Legal Scholarship Blog. 1. What inspired you to organise this event and what did you hope to achieve? This event has been something I have wanted to do since I joined the Faculty back in 2015. At the time, my research into the legal issues surrounding compulsory mental health treatment in Hong Kong had led me to the conclusion that the Mental Health Ordinance provided very few safeguards for the rights of mentally ill individuals, something which worried me. There was, however, minimal writing and discussion on this topic. I thought that an event where all the different stakeholders in mental health were brought together would be a good forum to discuss some of these highly important issues and fill in some of these gaps. Fast-forward to June 2016, when Co-Director of CMEL, Prof Terry Kaan, and I went to visit the Centre for Law, Medicine and Life Sciences at Cambridge (which we work closely with pursuant to an MOU between our two universities) and the Ethox Centre at Oxford, we met Dr Elizabeth Fistein and Dr Michael Dunn, both of whom were keenly interested in the topic of mental health. 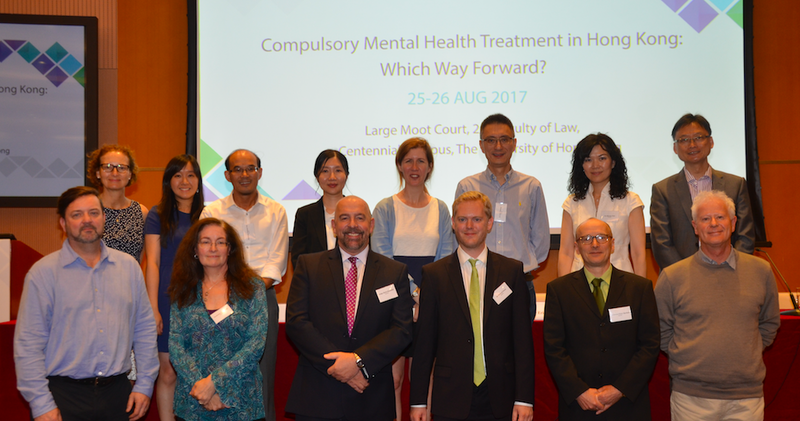 We had a lively discussion, following which we decided to co-organise a conference on the topic of compulsory mental health treatment in Hong Kong. Upon my return to Hong Kong, we discussed the proposal with the Hong Kong College of Psychiatrists, who also came on board as a co-organiser of the conference. With this conference, we hoped to achieve, at a minimum, more awareness about the legal issues facing compulsory mental health treatment in Hong Kong. We felt that not enough people were talking about, not to mention researching, this subject, and as a result it was not receiving sufficient attention and consequently sufficient impetus for legal reform. With more awareness, we hoped to garner support for change, as well as come up with a path to reform in Hong Kong. In terms of whether we were able to achieve these goals, our high attendance rate (highest of all the conferences CMEL has organised in the past) ensured that we were at least able to raise awareness about the various issues discussed during the conference (more below). Our audience included a wide range of professions, including psychiatrists, family medicine practitioners, clinical psychologists, social workers, members of the Equal Opportunities Commission, lawyers, mental health service users and representatives from mental health advocacy groups, students, and members of our Faculty. During our roundtables, we were also able to generate concrete ideas for how to move forward with reform – one idea, for example, was to put together a voluntary Code of Practice for psychiatrists working in the Hospital Authority. 2. What are the major mental health legal issues facing Hong Kong? The mental health legal issues facing Hong Kong are so broad that I will not be able to do them justice by discussing all of them here. This was also why we decided to focus on compulsory treatment, instead of mental health law in Hong Kong generally. Keeping in line with the conference, I will elaborate a bit here on the legal issues relating to compulsory treatment in Hong Kong, both in the hospital and community setting. To begin with, Prof Bartlett and Prof Petersen both gave powerful presentations about the lack of compliance of the Hong Kong compulsory treatment regime with the UN Convention for the Rights of Persons with Disabilities. Prof Bartlett argued that our current view of mental health law is mired in a vision where compulsion is the core, and because of this, it is difficult to see how we can achieve the goals of the UNCRPD. In the hospital setting specifically, I argued in my presentation that Hong Kong’s civil compulsory regime, in particular the long-term detention and treatment of a mentally ill individual, does not sufficiently safeguard the rights of individuals who are compulsorily detained and treated against their will. I focused on the role of the District Judge in the compulsory admission process, arguing that case law has restricted the District Judge to a largely administrative role, with no substantive discretion to refuse to countersign a patient into compulsory detention. This lack of an alternative to the medical perspective is problematic, and is exacerbated by the fact that the system has minimal safeguards on duration of stay, treatment and case review. In the community setting, although Hong Kong does not have a community treatment order, Dr Cheung told us about ‘conditional discharge’, which was enacted in response to a tragedy back in 1982. This is, in my view, a hugely problematic regime that allows for what is essentially compulsory treatment in the community with minimal safeguards. For example, there is no limit to the duration of this order, meaning that such an order will go on indefinitely until the patient is either recalled to a mental hospital for the breach of a condition or is discharged by the Mental Health Review Tribunal. There is no mechanism by which the medical superintendent can release or discharge the patient himself, which, as Dr Cheung informed us, was problematic for the doctors who wanted to release their patients from conditional discharge. 3. One of the speeches was delivered by Judge Mark Hinchliffe, Deputy Chamber President of the UK First-tier Tribunal. What did he speak about and do you see it as being potentially useful to Hong Kong? Judge Hinchliffe’s speech was on the role of the First-Tier Tribunal in the compulsory detention and treatment process in the UK. His speech covered various areas, including the key stages in the development of the current system of tribunals, the differences between the UK and HK models, what the First-Tier Tribunal does when it considers a case, and how we might think to further refine judicial involvement in the future. A lot of the discussion was, in my view, very useful for Hong Kong. For example, Judge Hinchliffe described the First-Tier Tribunal’s transition from a primarily inquisitorial to an adversarial model, which he argued helped to clarify issues and allowed for a greater focus on due process safeguards. Hong Kong’s judicial involvement in the compulsory detention and treatment process is largely inquisitorial, both at the admission stage and at the review stage. A move towards an adversarial model would be an important step towards the goal of providing sufficient safeguards for those who are subjected to this regime. Judge Hinchliffe’s insights about how to further refine judicial involvement were also very valuable for Hong Kong, although arguably much more difficult to implement. For example, he discussed the inclusion of an incapacity requirement in the compulsory detention and treatment regime, so as to achieve better parity with how physical health problems are managed. He also discussed problems with detaining mentally ill individuals based on their risk to others, given that there are many others without mental disorder who pose the same, if not greater, risk. Judge Hinchliffe has kindly agreed to allow us to post his speech on our website, so for those who are interested, please have a look here. His speech was the subject of an article in The Telegraph published on 29 August 2017. 4. What were some of the other important points made by the speakers at your event? I would say all of our speakers made very important points, and again I would not be doing them justice if I discussed all of them here. But allow me to give a brief summary of the topics that were covered. Prof McMillan kicked off our conference by giving us a framework of ethical concepts upon which the rest of our discussion was based. For example, he discussed the principle of ‘consistency and fairness’ and how it applies to a range of issues including scope of treatment and how illness is defined. Prof Bartlett and Prof Petersen then gave presentations on the UNCRPD, including such issues as what compliance with this gold standard would look like and why having compulsion in mental health law is problematic. Prof Petersen gave us particular insights into the situation in Hong Kong, and how the current regime may also not sit well with the International Covenant on Civil and Political Rights. Prof Dawson then gave a very helpful presentation on the usual contents of mental health acts in the Commonwealth, as well as the issues of continuing controversy, such as the inclusion of an incapacity requirement in the criteria for compulsion, and what alternatives might look like. Judge Hinchliffe started off the second day with his speech (which I have discussed above). Dr Fistein then discussed her empirical research on how practitioners decide whether compulsory detention is appropriate, and what factors they thought were most relevant. 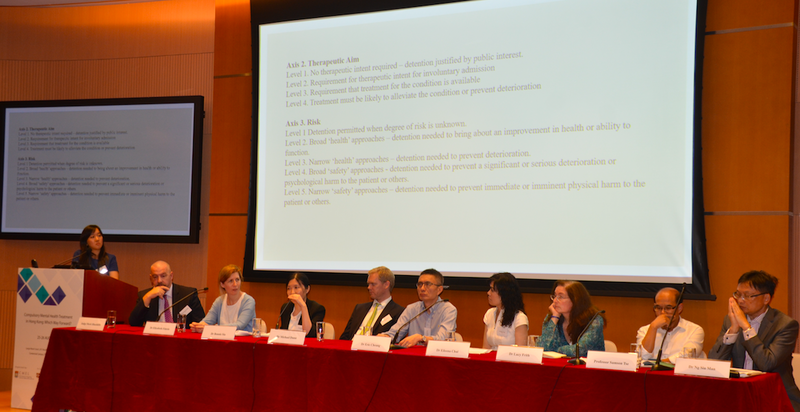 Dr Siu followed this with a presentation on the laws governing compulsory detention and treatment in Hong Kong and relevant statistics from Castle Peak Hospital. The next section, on compulsory community treatment, began with Dr Dunn’s presentation on the efficacy of community treatment orders and his empirical research on whether they are ethically justifiable. Dr Eric Cheung gave us our last presentation, covering the above-mentioned conditional discharge order, as well as some relevant statistics and local research. He ended with recommendations for compulsory community treatment in HK going forward. For more information about the conference including the programme, speakers' bios, abstracts and slides of presentations, and photos, click here. 5. What further research are you doing in this area? The collaborators of this conference and I will be putting together an article based on the results of the conference and potential contributions of the speakers. We hope to lay out a path for reform in Hong Kong, as well as discuss some of the pertinent issues that were raised. Separately, I have recently been awarded a research grant to work on the guardianship systems of mentally incapacitated persons in East Asian jurisdictions, including Hong Kong. With this grant, I hope to take an in-depth look at the extent to which the guardianship systems in these jurisdictions are underpinned by a set of consistent and ethical legal principles, and the extent to which these systems are compliant with local and international human rights standards. (Back row, L-R) Carole Petersen, Daisy Cheung, Samson Tse, Bonnie Siu, Elizabeth Fistein, Eric Cheung, Eileena Chui, Siuman Ng; (front row, L-R) John McMillan, Lucy Frith, Mark Hinchliffe, Michael Dunn, Peter Bartlett, John Dawson. an interesting report. actually here in USA there have been talks about the relationship between mental health and gun control. to me after i did one psychology assignment for this website it seems that making mental health the central focus of crime prevention rather than a useless assault weapons ban actually works, but liberal thinking cannot condemn a person for heinous acts and chooses to condemn guns instead, and not only guns, but the guns that are used the least overall in crime. shotguns kill way more people each year than assault weapons yet we see nothing about banning shotguns. libs go for the emotional response and throw facts out the window when it suits them as in this case. bring on the pictures of dead chidren the sheep will ignore little things like facts we'll get our worthless bills passed so that we can get those evil black guns off the streets (they are fooling themselves if they think that 44 million assault weapons already in circulation will just go away) and we'll start planning for the next election where we will take all those newly registered guns (now that we know where they are) and start confiscating them. don't think it will happen, just look at california. Registration leads to confiscation.